I didn’t stay up for the draft last night but I woke with the same feeling as Christmas Day – what had Dolphins GM Dennis Hickey delivered as a first round pick playing the role of Santa? 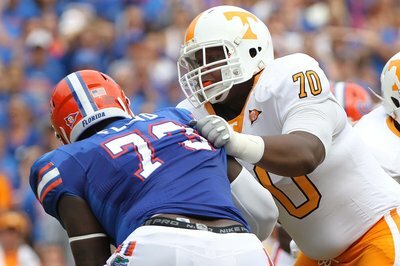 My first port of call was NFL.com, who informed me that we had drafted Offensive Tackle Ja’wuan James from the University of Tennessee. I’ll be honest, I hadn’t heard of him at all but I was relieved we hadn’t drafted Cryus Kouandijo of Alabama. Their analysis left a lot to be desired and it really felt like this pick had caught them on the hop. Like I said I didn’t know the name but I saw a few UT (University of Tennessee) games last season and I knew their pass protection was pretty solid as was their run game and in the SEC this isn’t a bad start. So I started to dig a little deeper and the more I dug I liked what I found. – Although a Right Tackle he appears to have the ability to move to the left side. This could be a good move in a couple of seasons when Brandon Albert’s shiny new contract expires. – Started as freshman in the SEC and had 49 starts for the Vols. Athletic and dominant great and looks to be a great zone blocker which is great for the run game and the pass game. – Part of an Offensive Line that only allowed 23 sacks in 2 years which is the 4th fewest in the NCAA. – Leans a little in pass pro which will open him up to the inside rush move. I say this only having seen a little bit of film and hope to be proved wrong. Looking forward to the upcoming rounds.